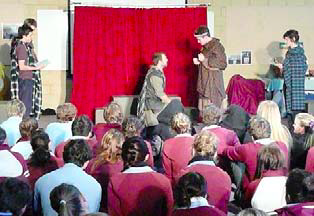 On August 1st, the Complete Works Theatre Company came to perform one of Shakespeare’s most renowned plays ‘Macbeth’. The performance was clever considering they only had three people to act out the play, with one actor performing more than 10 characters. The way they carried out the performance was perfect for a school project considering they picked out the most influential and important scenes. At the end of the performance there was a short period for question time, they answered the questions with thorough and descriptive knowledge, overall a very good step towards a better understanding of the complex, famous Shakespearian language.